The obituaries below are sent from Legacy.com. Notices are sent about those who served aboard USS Intrepid and who have completed their final deployment. Reported below are the obituary links that Legacy.com places on their website about Former Crew Members who have passed. If you are familiar with any person(s) listed below, you can read their complete obituary by clicking on the link listed under their name. If you become aware of a Former Crew Member who has recently passed, kindly send that person’s information along with their survivors’ contact details to our Good and Welfare Program Chairman, FCM Charles Coppess. His E-Mail is w5147956@yahoo.com. Please also send an E-Mail Cc… to: uss.intrepid.fcm@gmail.com. Thank you. 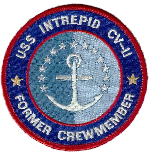 Below are the obituary results for those who served aboard USS Intrepid as reported by Legacy.com.